There are two basic kinds of piano. A grand piano has its strings running horizontally and has the distinctive curved shape. The lid can be lifted and propped up. The upright, or vertical piano, has the strings going up and down and the back side fits up against the wall. "Upright" is a term usually for the old verticals that were very tall. 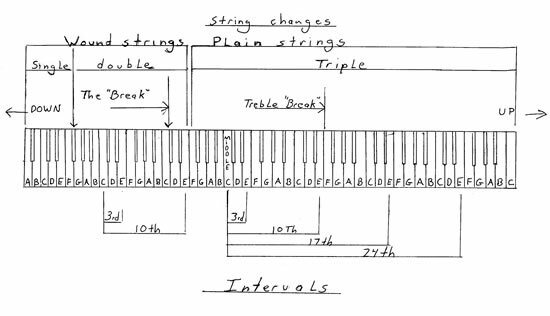 "Vertical" is the current term for any piano with strings running from the floor up. The smallest vertical is 36" tall from the floor to the top and is called a spinet. Many people think spinets are too small to make a good piano and many of them are very bad. A well made spinet can be a decent piano however and the Baldwin Acrosonic was good example of this. (Baldwin changed the Acrosonic to a 42" piano later on.) The real problem with the spinet is the "drop action". All the working parts are sunk beneath and behind the keys making it nearly impossible to repair. If the piano is around 42" tall it is called a console. This is probably the most common modern piano. A 45" piano is called a studio piano and, as its name implies, would be good enough for a teaching studio. Taller pianos may have many different heights and might be called a concert-vertical. Piano companies quit building taller verticals until the last few decades. Yamaha builds the U-1 and Baldwin makes a 60" concert vertical. Grands come in various size also. The standard household grand is 5'8" and I call this just "grand'. Anything smaller is a baby grand. 5'10",6', 6'2",and 6'4" are "grands". A 6'8" have at times been called a "parlor grand" and a 7 foot pianois a semi-concert grand while 9 foot piano is a concert grand. "Concert" refers to it being used in a concert hall. Grands are measured from the nearest point to the farthest point away from you if you're sitting at the piano. Why are there different sizes? With size comes more and better sound. If there were no compromises in designing a piano it would be 32 feet long and weigh 5 thousand pounds. People are afraid to put the piano on an outside wall. This bit of wisdom must have come from the days when a wall had no insulation and had cracks big enough for snow and rain to get through and into the piano. It makes no sense today. The only real environmental concern would be sunlight from a window slowly fading the wood color. In theory, a piano should not be over a heat vent or a baseboard heater but I've never seen any real problem. The piano goes where it works for you and don't lose any sleep over it. In rare cases a piano near a wood stove that heats the house can be very bad, but I see exceptions to this all the time. A cracked soundboard is nothing! Almost every piano has cracks in the soundboard. They may go away in the summer and come back in the winter. The big piano companies researched this and found that you could even cut out parts of the soundboard with no change in tone. The bad thing is a crack in the cast iron frame. (It's gold and called the plate or the harp.) One crack here and you have to throw the piano out. Iron can't be welded. 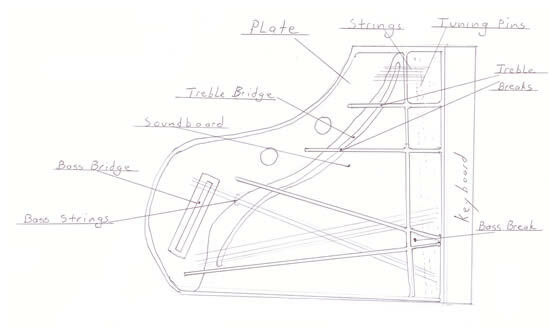 If a piano has a cracked plate, the bottom half may be in tune but the top half might be a whole step lower. Ironically, I've seen two pianos that were cracked in the worst possible spot that showed no sign of tuning instability. A crack in a soundboard may buzz if it's really bad, but this can be fixed. 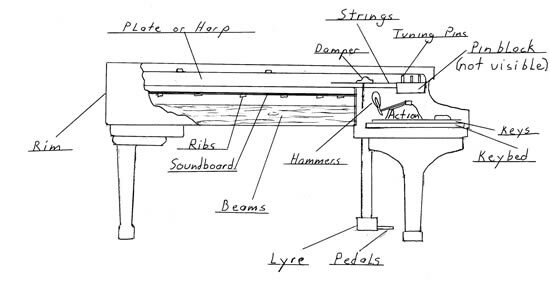 Seeing the inside of your piano is fairly easy. With a grand piano, just stand at the right side of the piano and lift the top, or lid up and you will see a stick that tilts up and fits in a spot under the lid. This holds the lid up. (Some lids are quite heavy.) Now grab the thing the music sits on and slide it toward you. It should slide right out. Some pianos have a funny way this comes off, such as Knabe's, in which case you slide it in and out lifting gently until it hits a slot and it lifts off. Now you can see just about everything. Some verticals are tricky to open. Don't try to open an Everrett piano. I'm sure every tuner remembers the first time they tried to open an Everrett. If you have a smaller, modern piano feel under the left side of the lid. If there are hinges on the left side don't go any further. Most vertical lids are hinged in the back and just lift right up in front and can be rested on the wall. Some lids have a left and right clip holding the lid down and might need a firm impact from the base of the palm to open. The front panel often comes off with a latch on the left and right inside corners. If there are screws, better stop here. The vertical panel under the keybed simply falls right out once the little metal stop screwed to the underside of the keyboard is pressed up. Don't try this if there are fancy parts above the pedals or an assembly holding the pedals in front of the panel. Be warned, I take no responsibility for what you do, or what you might find inside! New or used? It's purely personal decision. I like the classic pianos made long ago but there are not too many around today. Most people seem to like the high gloss polyester finish of the new pianos and there's a perfection of evenness that comes from the factory in a new piano. A used or rebuilt piano is an unknown to some extent (you should always have a good technician look it over). However, in today's new piano market there is a bewildering shell game of brands, builders, and factories that only a good dealer can follow. Pianos reached their perfected form around 1880. With few exceptions any part from a one-hundred year old piano would fit in a brand new piano, and there are thousands of little parts. The overall design has not changed, although many interesting deviations were tried around the turn of the century. Between 1890 and 1930 the piano had its heyday. Pianos were the luxury item for the household. Many bad pianos were sold but hundreds of thousands of great instruments were hand made with exquisite woods and many of these pianos are still around today. In terms of tone and response, these pianos often have a dimension not found in modern instruments. An ornate piano was an impressive addition to a home's parlor a century ago and the "piano scarf" was a way to make it more luxurious. A piano scarf was a fancy cloth that covered the top of an upright piano and the Montgomery Ward's Catalog from that time might advertise six or seven different grades. The market for pianos began to weaken long before the depression. Other forms of entertainment, such as the movie theater, phonograph, and radio began to erode interest. The number of piano builders one hundred years ago is staggering. There were close to three hundred separate builders in the Chicago area alone. St. Paul had at least one builder. Smaller towns such as Rockford or Elgin Ill. had piano companies. A tuner rarely saw the same brand twice. Many companies lasted a year or two, many were bought out just as quickly, and many merely assembled pre-made parts. There are companies today that reproduce the old maker's emblem that sits on the board above the keys, as a service to refinishers. One company has 36 pages of decals and each page contains about 48 manufacturers. What makes this so interesting is that each company used its own unique design. So old pianos are like a library for any one studying acoustics or piano design. New pianos are good but there are so few brands left that a pianist sees just a narrow band of possibilities. The poorly made instruments were junked long ago. The best examples remain to be rebuilt for a new century. Denker Piano serves northern Wisconsin and Minnesota with quality piano tuning, repair, rebuilding, sales and piano instruction. © 2018 Denker Piano. All Rights Reserved.